Difference between revisions of "STEM Eclipse Setup"
This is a tutorial on how to get the STEM source code downloaded, compiled, and running in your Eclipse Development Environment. This tutorial is mainly for committers and advanced users that want to work with the STEM source directly. Before you attempt to checkout and compile the STEM source code, some additional features must be installed into your Eclipse SDK. Much of STEM is built using modeled code generated by the Eclipse Modeling Framework. To extend these models, or editing existing models, EMF must be installed into your environment. This installation guide requires that Eclipse EGit be installed. In addition to EGit, much of STEM is built using modeled code generated by the Eclipse Modeling Framework (EMF). To extend these models, or edit existing models, EMF must be installed into your environment. # When the ''' Install ''' dialog opens, select the '''Indigo''' repository from the drop-down menu. Wait while the list of additional features loads. # When the ''' Install ''' dialog opens, select the '''Juno''' repository from the drop-down menu. Wait while the list of additional features loads. You only need to install one or the other. Either will work for the rest of this guide.
''' Important Note: ''' Before beginning these steps, committers should [[STEM/Git_Migration#Additional_Steps_for_Committers|read these important details]] about checking out from Git. # When prompted to '''Select a workspace''', choose a new path that does not contain an existing workspace. This creates a new workspace. # '''Trouble shooting for SSH.''' If you're getting authentication exceptions checking out the STEM source code, make sure you've configured SSH in the Eclipse preference settings correctly. Instructions for doing this can be found here [[http://wiki.eclipse.org/EGit/User_Guide#Eclipse_SSH_Configuration SSH Configuration]]. Do not upload your public key to GitHub, instead you need to upload it to Gerrit here: [[https://git.eclipse.org/r/#/settings/ssh-keys Gerrit SSH Upload]]. Once the checkout completes, there will likely be hundreds (or thousands) of build errors. STEM uses what's called an Eclipse Target Platform to manage the rest of the dependencies that must be installed to completely build and run STEM. The following steps will help you in applying the target platform. : '''Important Note About Target Platforms''': The target platform represents which version of the Eclipse Platform to compile and run STEM in. the following is a fast path to update your workspace. '''First be sure to Install Java 8 on your Machine (both JDK and JRE)'''. Open a terminal window and type java -version to make sure it's installed. # Do a git PULL to update your current workspace with the latest and merged changes. Your build will break but don't worry about that. # Point your new Eclipse at your workspace. It will ask if you want to migrate. Say yes. # Your build will still be broken. Go to '''org.eclipse.stem.releng.targetplatforms''' and check that you see STEM3.target If you see it then you correctly updated GIT in step (1). If you don't see it, then update (pull) the latest. # You may have to apply the target twice as it is reported to fail the first time. # Got to>Eclipse>Preferences>Java or >Windows>Preferences>Java ''and make sure you point BOTH the Compiler and the Installed JREs to Java 8''. '''Please Observe''': There is an issue with the latest version of Eclipse Oxygen on some platforms that causes the Ant build to fail. The default path for ''eclipse.pdebuild.home'' in Ant properties has a final dot (.) at the end of the path value. Removing this final dot(. ), or adding (/) after resolves the issue. The bug has been reported to Eclipse. Once STEM is built, it's time to build the STEM data sets. This process transforms the data from a raw, human-readable format to STEM modeled data files that are readable by scenarios, models, decorators, etc. STEM is a Java application built on top of the Eclipse Rich Client Platform (RCP). To build and run STEM, a developer must install a supported Java Development Kit (JDK) and the Eclipse SDK. While it may be possible to compile STEM in another IDE, we strongly recommend you use the Eclipse SDK. When the Install dialog opens, select the Juno repository from the drop-down menu. Wait while the list of additional features loads. Once your Eclipse environment is set up, you're ready to checkout the STEM source code. 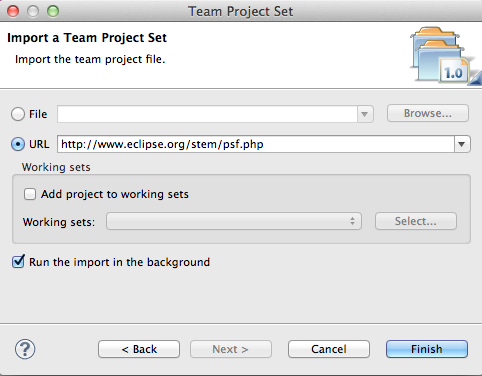 The STEM Project provides an Eclipse Team Project Set (PSF) that'll help you quickly get the STEM Source code checked out. Important Note: Before beginning these steps, committers should read these important details about checking out from Git. When prompted to Select a workspace, choose a new path that does not contain an existing workspace. This creates a new workspace. Depending on your connection speed, this step may take over an hour to complete. Have some coffee and come back. Trouble shooting for SSH. If you're getting authentication exceptions checking out the STEM source code, make sure you've configured SSH in the Eclipse preference settings correctly. Instructions for doing this can be found here [SSH Configuration]. Do not upload your public key to GitHub, instead you need to upload it to Gerrit here: [Gerrit SSH Upload]. 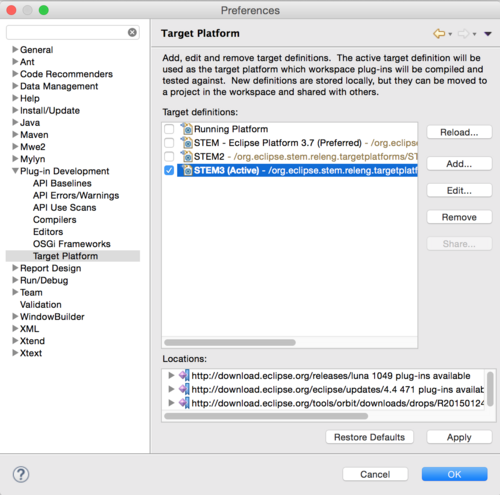 Important Note About Target Platforms: The target platform represents which version of the Eclipse Platform to compile and run STEM in. Wait while Eclipse loads the Target Platform. Depending on your connection speed, this step may take up to 30 minutes to complete. First be sure to Install Java 8 on your Machine (both JDK and JRE). Do a git PULL to update your current workspace with the latest and merged changes. Your build will break but don't worry about that. Point your new Eclipse at your workspace. It will ask if you want to migrate. Say yes. Your build will still be broken. 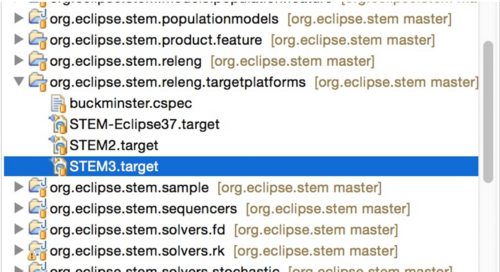 Go to org.eclipse.stem.releng.targetplatforms and check that you see STEM3.target If you see it then you correctly updated GIT in step (1). If you don't see it, then update (pull) the latest. You may have to apply the target twice as it is reported to fail the first time. Got to>Eclipse>Preferences>Java or >Windows>Preferences>Java and make sure you point BOTH the Compiler and the Installed JREs to Java 8. Please Observe: There is an issue with the latest version of Eclipse Oxygen on some platforms that causes the Ant build to fail. The default path for eclipse.pdebuild.home in Ant properties has a final dot (.) at the end of the path value. For example, you may see the value C:\Users\account_name\Desktop\Stem\eclipse-rcp-oxygen-1a-win32-x86_64\eclipse\plugins\org.eclipse.pde.build_3.9.300.v20170515-0912\. Wait while the data builder runs. Once the STEM source is compiled and data sets built, it's time to launch the STEM application. The following are advanced topics that existing developers may be interested in. If you're new to STEM development, you can skip this section. The STEM project contains several gigabytes of "earth science" data derived from NASA and NOAA satellite imagery. These data include global elevations, air temperatures, rainfall, vegetation coverage, etc. By default, this data is not included when you checkout STEM. These steps will help you checkout and build the earth science data for use in your STEM development environment. This check out may take several hours.